OUTREACH TASK GROUP: This group of dedicated volunteers continues to pray for guidance and faith as it reaches out into the community to help others know the love Jesus. This group has worked on developing community programs that bring our presence into our neighborhood. We now hold an annual "Pulling for Vets" Dinner to raise money for Disabled American Veterans, chapter 66. 2018 was our 3rd year and we were able to present them with a check of $3000 (this also includes proceeds from a Blueberry Sale at the church in the summer). The members of this ministry coordinate the stocking and delivering of food baskets for Christmas, Easter, and Thanksgiving (typically, 12-15 families are assisted each season). ​Our fundraisers have also benefited the local Funny Farm Animal Rescue. The Rescue provides sanctuary to over 500 animals of all types. Also, we have done collections of needed items in conjunction with the ELCA Outreach Ministries. Our collections have included School Supplies to help area children, Baskets of Promise to collect toiletry items for those in need in other countries, Buck a Chick which raised money to provide families with chickens that they can raise in order to provide for themselves. Other worthy programs are periodically considered for funding or “in kind” donations. WORSHIP AND MUSIC: Under the leadership of Pastor Werner and Maria Douhknai, and with added talent of our choir and many volunteers, music is an important part of our 9:00 AM Praise service and our 10:30 AM Traditional service. In addition, volunteers in this ministry provide the visual cues to the liturgical seasons, distribute the altar flowers to shut-ins (or others as appropriate), decorate for Christmas, and oversee Sunday Coffee Hour. 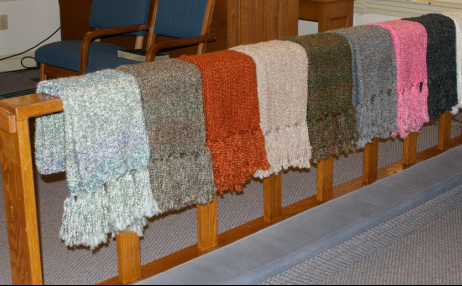 PRAYER SHAWL MINISTRY: This group of dedicated volunteers knits shawls and laprobes that warm the hearts and bodies of members of the Congregation and others across the world. Some are given in celebration of the birth of a child. Others provide comfort and may speed healing after surgery, loss of a loved one, or other physical or mental distress. Residents of assisted living facilities (Wesley Manor, Ocean City; Sunrise, Galloway Twp.) and Hammonton Nursing Center have gratefully received the shawls, as have individuals as far flung as Florida, Germany, Nebraska, and Sweden, and members of the immediate community. BUILDING FOR THE FUTURE: This group oversees (and sometimes participates hands-on) the work to keep the facilities that house our congregation and our pastor in good working order. This is essential to our continued spiritual well being as well as the health and safety of all who enter within our walls. It is also critical if we are to continue to spread the Good News and function as the hands and feet of God. They also cope with the contracts and with permits… a versatile group. EDUCATION: This program provides opportunities and activities for adults, youth, and children. Presently we have a Church School Program on Sunday mornings at 9 am for pre-school through 6th grade. Jennifer Johnson with Jayne Carmen provide a great program for our young ones. They are always thankful for those who are willing to step up an assist. The Pastor typically instructs confirmands in understanding the scriptures, their daily walk of faith, and Lutheran . We have a youth coordinator, Michele Brosman, who provides a program for the children and family of our community. During the summer we have a week of VBS which focuses on a theme for the week. At various points throughout the year, Pastor Werner leads a Bible Study Group on Wednesdays. Other Adult programs meet during the week, usually in the evenings. St. James has a history of small group studies, both Bible and Book Studies. Some studies are led by clergy and some led by lay people. In the past we have read the works of authors such as Kelly Fryer, John Shelby Spong, Marcus Borg, Scott Gustafson, and John Dominic Crossan. These books introduce lay people to ideas near the current frontiers of Christian theological thinking and encourage the readers to wrestle with the ideas, sharing their concerns and personal “break-throughs” with others who are working with the same new ideas. You can learn more about the current group by seeing our Announcements Page. ST. JAMES WOMEN’S GROUP: Although a small group, the women of this group are important to the ministry of fellowship and providing the leadership for our various pot-lucks and events. They are wonderful bakers and contribute through bakes sales at our various events. They provide gifts to the church to help with the various parts of our ministry. All women of the church are invited to participate in this group. They meet the second Monday of every month at 1 p.m.